The rooftop solar plant scheme is – as the name suggests – a scheme that will help solar powered energy generation. Solar panels shall be installed on top of the roofs and they will help the owner get free energy. Not just that, this will help the country move forward towards a cleaner and more sustainable method of energy consumption. Special provisions are made under the budget to carry forward this scheme and it is already set to cost Rs. 35 crore to the state. This project will begin somewhere around 2017-18 in the state of Gujarat, although other states might follow suit soon. The Gujarat government is encouraging the owners of houses to turn their rooftops into solar power installation arenas. Anyone who owns a house or a property can apply for this scheme. This entire system is put in place for the individual households. This is why the industrial, commercial, government or semi-government agencies cannot partake in it. Or, in other words, it cannot be used for commercial purposes. The target is to provide this service to 1 lakh consumers initially. If by chance the scheme is unable to tend to that many consumers at first, it can be scraped or discontinued. Right now the state government has a capacity of 1300MW including the commercial solar power plant. The rooftop power plants will hardly be of 30MW. The state government shall use full capacity to achieve their targets. The target is to generate a whopping 8024 mega watt of electricity annually. However, out of this 3200 mega watt shall be of grid connected solar power plants. So some pressure shall be alleviated off the solar plants. All the subsidies under this scheme are given by the central government. However, the applicant can have both national as well as state government benefits. But, an applicant cannot apply for more than one state subsidy at any given time. Clubbing two or more schemes and obtaining subsidies for them is prohibited under Gujarat state government. This might also mean that you could end up losing the solar energy subsidy, if you club more than two subsidies. The subsidies shall be available on a first come, first serve basis. The scheme shall give Rs. 10,000 per kilo Watt as a monetary subsidy under this scheme. However, that is after the installation. There is a Rs. 20,000 monetary ceiling on the subsidy. So if you install more than 2 kilo Watt then you will get up to Rs. 20,000 as a subsidy only – not more than that. As far as the cost of installation is concerned, the state shall give Rs. 69,000 for installing solar power plant with 1kW power. You can collect the subsequent subsidies from Gujarat Energy Development Agency aka GEDA. https://geda.gujarat.gov.in/ is the official website where you can register for this policy. In fact, the moment you click on this link you can see a ticker at the bottom under News / Events. This ticker has “Residential Solar Rooftop System” written on top of it and there are certain details also mentioned underneath. You can get the application form from GEDA, Gandhinagar. You have to duly sign the application form and enclose all the details in it. Also, whatever fee is charged for the same shall have to be drawn in favor of Gujarat Energy Department, from a nationalized bank only. 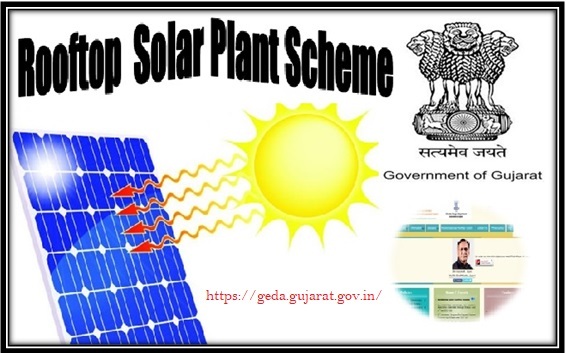 You can also go to this link – https://geda.gujarat.gov.in/application_forms_files/Application_form_for_registration_of_Solar_Power-Rooftp_project.pdf and download the form and then take a print out of the form. You can also get this form from GEDA, Gandhinagar. No matter where you get it from, you have to submit it at GEDA, Gandhinagar itself along with the registration fee. Simply go to the above link and then download it. You can also take a direct print out so that you can access it. Now you have the official document. From then onwards the process is very self explanatory. You will have to input the capacity of the project that you are applying for on top of the application form. Input all the details correctly and then don’t forget to include your signature and date at the bottom of the pages. After that all you have to do is submit it with the authorities. You have to submit the documents suggesting that you have the right ownership of the place where the solar plant is going to be installed. This might include property documents. India is already the home of billions of people. This means that the per capita environmental degradation is high in this country. We are at a greater risk of reducing the wellbeing of our surroundings. We can start bettering it by depending on renewable sources of energy. It is the responsibility of each individual to make the Earth a sustainable place and better place to live in. This is why this step is a step towards the future. The Gujarat government has certainly taken a step forwards towards the right direction by implementing this scheme. Although the installation process and the entire process itself is new, there are several things to consider here. It will also help the government have a self reliant consumer base which is so essential for a country like India. Yes, right now the country is giving subsidy so it is spending from its own pockets. But to encourage the adoption of this new technique such a boost was mandatory. Gujarat too is stretching out its helping hand for the cause and is giving a separate subsidy for the cause. If you also own a residential property of your own in Gujarat then you can use the rooftop scheme to get subsidy. It may actually help you with lot of things apart from the fact that you shall be getting monthly subsidies for the same.